Inkman has a huge range including ink cartridges, refill kits, laser toner, specialty print photo paper and much, much more. Whatever you choose, Inkman will deliver in super fast time, the very next day. Mention “Bright Ideas” on orders over $80 and you’ll receive a free inkjet paper pack worth $10! Place your order of $80 or more in the next 40 minutes, and receive a further $5 off your first purchase. 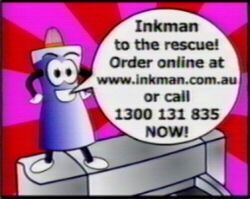 Inkman just keeps saving you money! Inkman.com.au truly is the easiest, most reliable and most convenient way to buy all your printer supplies from popular brands including consumables for Hewlett Packard, Canon, EPSON, Lexmark, Samsung, Panasonic, Brother and many more.